The second day of the 2017 ITTF Challenge Belgium Open being held in De Haan featured plenty of success for Japanese competitors across the two senior singles tournaments, while there were also two trophies up for grabs on Friday 3rd November. Missed any of the day’s action? Then take a quick look at our review. Hitomi Sato continues to lead by example at the very top of the Women’s Singles draw, claiming back-to-back victories against opposition from Korea Republic to earn her place in the semi-finals. The top seed required just the five games in her Round of 16 meeting with Kim Eunji (11-8, 9-11, 11-5, 13-11, 11-6) and proved too strong for eighth seed Lee Zion one round later (13-11, 12-10, 5-11, 11-2, 10-12, 11-6). There was also a promising outcome for Saki Shibata, who came out on top against Croatian representative Sun Jiayi without dropping a game (11-7, 11-4, 11-8, 11-4). Yui Hamamoto is the third Japanese player through to the last four after the third seed narrowly saw off Russia’s Maria Dolgikh (11-7, 10-12, 11-6, 13-15, 13-11, 8-11, 11-7). However, Japan won’t secure all of the top four positions following an exceptional performance from Polina Mikhailova in the lower half of the draw. Polina Mikhailova pulled off a superb comeback from a three games to one deficit to oust second seed Honoka Hashimoto from the event (9-11, 11-7, 12-14, 7-11, 11-9, 13-11, 11-7). Just the four players remain in the hunt for the Men’s Singles title as the category surpassed the quarter-finals stage on the penultimate day of action in De Haan. Kim Donghyun was one of the successful competitors in the last eight as the Korea Republic athlete held off a brave challenge from Slovenia’s Darko Jorgic (9-11, 6-11, 11-9, 11-5, 11-8, 8-11, 11-6) to book an encounter with Germany’s Ricardo Walther. Two qualifiers are also, somewhat unexpectedly, through to the semi-finals of the competition with the unseeded Japanese contestants Masaki Takami and Yukiya Uda prevailing over Simon Arvidsson (6-11, 11-6, 11-7, 9-11, 11-6, 11-4) and Patrick Franziska (11-7, 8-11, 12-14, 14-12, 11-8, 11-9), who entered the respective fixtures as the fifth and 24th seeded players. 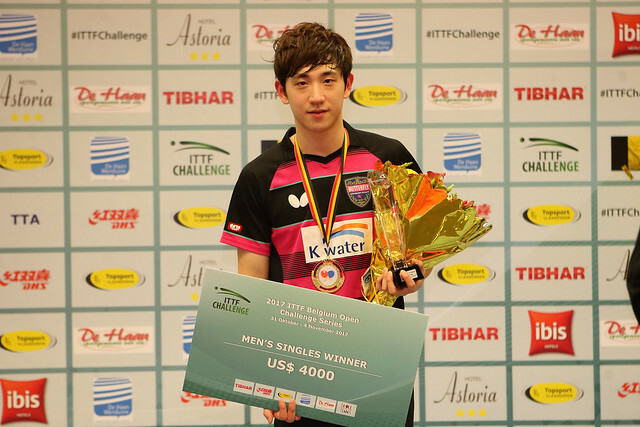 The first gold medals have been awarded at the 2017 ITTF Challenge Belgium Open and surprisingly the top seeds for the two Under 21 events were both restricted to second position finishes. Shunsuke Togami of Japan produced a stunning performance to beat Hong Kong’s Lam Siu Hang (11-3, 11-8, 8-11, 11-8) to lift the Under 21 Men’s Singles trophy while over in the Under 21 Women’s Singles final it was Chinese Taipei’s Li Yu-Jhun who featured on the top step of the medals podium, defeating Lee Zion across four games (8-11, 11-4, 11-4, 11-6).